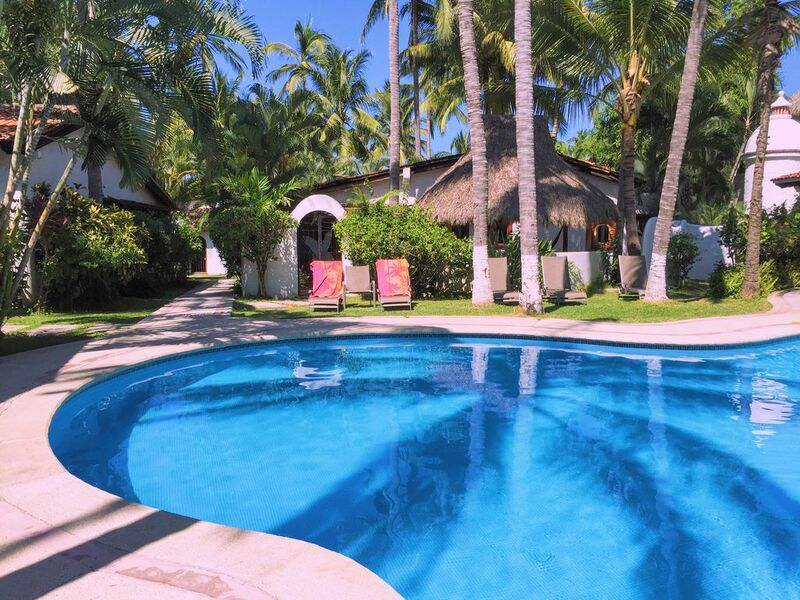 MARGARITAVILLE - UPSCALE Sayulita Home with Pools, Beachfront Complex! WOW!! Amazing Upscale unit: Many Luxury Upgrades! Margaritaville, the PERFECT SAYULITA VACATION SPOT!! Welcome to our vacation home “Margaritaville” located in Sayulita Mexico. Ours is a family friendly house nestled into one of the most sought after places to stay in Sayulita, the Los Delfines complex, it is one of a few beachfront complexes located in Sayulita. Margaritaville is one of 12 three bedroom homes, these homes share two swimming pools and a common beachfront area. Margaritaville is located a mere 100 flat paces to the sand and ocean and fronts onto a spotlessly clean swimming pool. It’s a short walk down the beach to Sayulita’s surf break, a favorite break known for its easy waves for beginners, and consistent surf. Surf boards and lessons are available for rent right on the beach. The water in the area beside the surf break is shallow for a long way out, great for little swimmers. Margaritaville is one of the most convenient locations in Sayulita, two small grocery stores are a 4 minute walk away, and the closest restaurants are 2 minutes away. It is an easy eight minute walk to everything including the downtown plaza and the many varied restaurants, services, and shopping that Sayulita has to offer, yet it is far enough away from the late night noise that sometimes occurs in that area. Everything in town is walking distance from this location! Margaritaville is the PERFECT LOCATION for people that want to be close to everything, yet still want to enjoy the sounds of the ocean and crickets at night. Recently remodeled and now ultra luxurious, new finishes include new bathrooms, granite upgrades, marble tiles and stone inlays, plus new windows and patios. This luxurious house features over 2500 sq ft of private living area including the private deck areas. • The first bedroom is a master bedroom with a king bed and its own private bathroom. Patio doors open to a side courtyard. • All bathrooms feature marble tiles, custom stone inlay, marble counter tops, rain showerheads, and hair dryers. • Alarm clocks in the bedrooms. • Set your own code in the locking safe provided, large enough for your laptop. • Air conditioning in all the bedrooms, controlled by an adjustable remote control. • Oven and stovetop with 4 burners and griddle, private BBQ outside of kitchen near your palapa covered deck. • Coffee maker, a toaster, a blender, an old-fashioned juicer, plus dishes, utensils, pots, pans, and many convenient extras. • Breakfast counter next to a round dining table. • Ipod/MP3 compatible stereo CD player, with USB plug, so bring your music! • Our home has no TV on purpose, we prefer to play games and encourage the kids to use their imagination while on holiday. • Included free wireless Internet connection, so bring your laptop if you wish to stay connected, or provide DVD watching for the kids. • In the front of the house we built a private child safe courtyard that looks onto the pool. This walled and gated area helps keep small swimmers out of the pool. • We’ve also mounted a hammock in this area for afternoon siestas. • The palapa is a great place for lunches, or some shade on hot days. • The courtyard palapa has room for everyone, and is the perfect place to relax out of the sun, or to have a glass of wine, an ice cold beer, or margarita later in the evening. This multi-purpose area can be enjoyed all day and evening. We spend a great deal of time here when we visit. •	The house has a washer and dryer. •	All linens, bath and beach towels are provided. •	4 portable folding chairs and umbrella for your use at the beach. •	Daily maid service everyday except Sunday. •	Numerous ceiling fans throughout to keep the place comfortable, AC in bedrooms. •	Outdoor shower and foot wash for removing sand. •	Night Security guard at the complex for your peace of mind, and on site caretaker lives next door. Sayulita is a great town with a lot to offer. There are spas for those that want to be pampered, and many activities such as horseback riding on jungle trails, zip lines, ATV rentals, sport fishing, surfing, boogie boarding, and skim boarding. The sandy beach features nice swimming, sun tanning, snorkeling, and you can relax on the sand or rent an umbrella and chairs. On occasion dolphins and whales sport within sight. You can eat the street food, or sample the many restaurants in the area. You can see the fish the fishermen bring in, send the kids shopping at stores or booths in the town square, sample the local ice cream and baked goods, and best of all you can walk at night. For those interested in nightlife, there are several places that feature salsa dancing, or DJ music and dancing, depending on the night of the week and the time of year. The more adventurous can leave Sayulita to visit nearby towns and attractions. Margaritaville has the perfect location for those that want to experience what Sayulita and surrounding area has to offer. The gated courtyard makes it a unique, child safe family friendly rental. The renovation makes it an ultra luxurious retreat that you are sure to enjoy! After visits to Cancun, Playa Del Carmen, and Puerto Vallarta, we finally found a town in Mexico that had a lot to offer beyond a typical tourist experience. Sayulita has a nice beach, great beginner surf, as well as a very nice people living here. We have always felt very welcome and safe here, the people are great, and our kids love it. There is always something to do, and we tend to relax well as a family while visiting. We have been visiting since 2001, and although the town has changed, the character of the place remains the same. The house is great for large groups, with 3 bedrooms and 3 baths, it is great for people planning a vacation with extended family such as in-laws. With our 3 girls, the 3 bathrooms make for less time arguing over the shower and sinks. The house has great outdoor deck areas, including places to get away from your group and recharge if necessary, plus areas to have the group gather and relax. The gated courtyard can keep small swimmers out of the pool area, it also serves as a central place to meet, relax, and eat meals. Margaritaville is a great family friendly place to visit. Sandy beach in front of the property! Amazing Beachfront complex with shared beachfront area. Great view area for ocean sunsets! Located in an oceanfront complex, one of the few places in Sayulita. 2 spotlessly clean swimming pools, one in front of the house, and one behind the house.